For many years I’ve been quite disappointed with the information survival books provide on primitive/survival fishing. Since I have a lot of experience in the practicalities of such fishing, I decided to write a book about how to actually catch fish. There are many more subtleties than one would think. 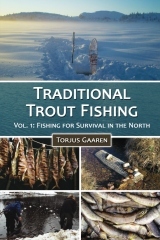 In “Traditional Trout Fishing: Fishing for Survival in the North” I’ve attempted to describe the fishing techniques in detail and the conditions that determine success. There is also a bit about food preparation, cooking, long and short term storage. A second volume is coming (probably end of 2015), where I’ll expand a bit more on food preparation, but mainly go into the crafts associated with making the fishing equipment. As of right now, you can get hold of the book at Createspace. Update: It is now also available on Amazon.